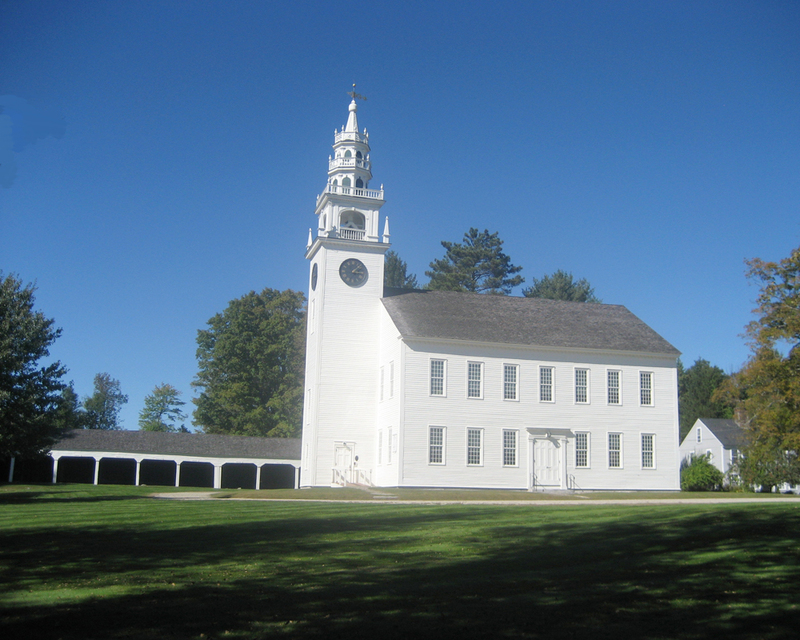 The Meetinghouse from the southwest. September 2016. By village tradition the walls of the Meeting House were raised on the day of the Battle of Bunker Hill, June 17, 1775. Captain Samuel Adams had the contract. He was assisted by his wife's brother, Jeremiah Spofford. The building received its first coat of paint in 1798-1801. In 1822 the "Christopher Wren" bell tower was added, built by Joel Oakes Patrick. The building was first used for Town Meetings and services of the Congregational Church. In due course use was shared with other denominations. In 1831 the present brick church was built, and the Congregationalists moved out. The other denominations also acquired buildings of their own. Except for Town Meetings the old Meeting House was not again put to regular use until after the Civil War. In 1870 the interior was remodelled to provide a town office above and school rooms below. The school rooms were not long needed, and in 1914 the Town Office and place for Town Meetings were transferred to East Jaffrey. The old building received a basic renovation in 1922 and has since been used for entertainment, lectures, an occasional reception or other purposes. It is the finest as well as the oldest landmark of Jaffrey.